Las Vegas —Are you the type that thinks video games were so much better back in the simpler times, before 3D graphics and realistic settings? Perhaps you're a fan of the Super Nintendo? 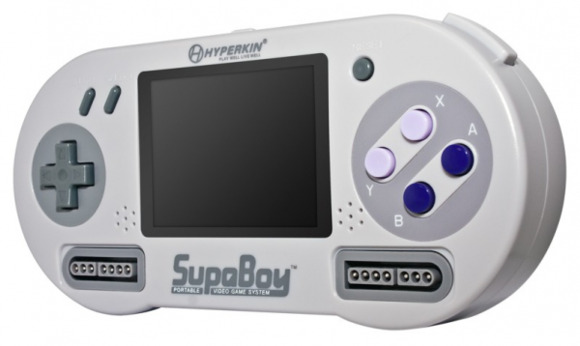 Hyperkin would like to speak with you. This is no emulator: this is literally a chip-set of an SNES (Super Nintendo Entertainment System) inside of a handheld gaming device, shaped conveniently like an SNES controller. If you're tired of the little screen, plug it into your TV with the AV-out port, plug in a classic SNES controller to the front of the Supaboy and enjoy your bite-sized console. Time to grab your old cartridges from the attic, blow out the dust (that isn't the recommended way to cleaning game cartridges, but you'll do it anyway) and get your retro gaming on.